Published on April 22, 2016 by Martyn. Be the first to comment! 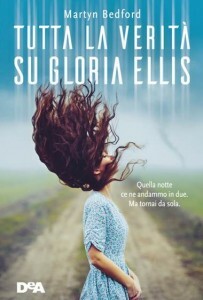 Here’s a sneak preview of the proposed cover for the Italian edition of Twenty Questions for Gloria, which is being published later in the year by De Agostini. The title is “The whole truth about Gloria Ellis” and the strapline roughly translates as: “Two of us left that night. Only one returned.” I love the cover image. I just wish I had enough hair left to do that!